I wasn't, I never flew my first aircraft until I was out of college and in flight school for the military. And how did you get into flying then? I went to the Naval Academy for college because I wanted to serve in the Navy and the Naval Academy decides for you what's best in terms of how you're going to serve. I was told I was going to be a Navy pilot and so I checked into flight school almost nearly thereafter. Do you regret joining the Navy? Not a bit! It's the best decision I've ever made, short of finding my wife! So I assume you've been on a carrier, if so did you like life aboard? I have been on a carrier. I was on the Theodore Roosevelt for a number of months and life aboard it is challenging as you would expect to live onboard a ship that has over 6000 other people on it in close quarters. It's certainly not bad and the conditions are very livable. We have Internet, TV, so you can communicate with the outside world and the food is decent. It gets worse after you’ve been at sea for a long time. I can imagine that! Have you been in combat? I have. I flew combat missions over Iraq for Operation Iraqi Freedom. Oh, can you tell me about the some of them? Sure. All the F-18s which is the aircraft I flew in combat are serving in the role called “close air support.” So we were supporting the men and women on the ground in the Army and the Marine Corps who are attacking targets or searching out for terrorists who are on the ground. So we were in a support role there in terms of being their eyes in the air and having ordnance on board that if they call in for an air request to get the bad guys, we can service that role. And can you tell me about some of the missions you flew? Sure. We flew a lot of them over different cities. I spent a lot of time over Baghdad but also Mosul, Tikrit, Rahmadi, Fallujah and we spend all of our time, like I said, talking to forward air controllers on the ground and trying to assist them in any way we can. 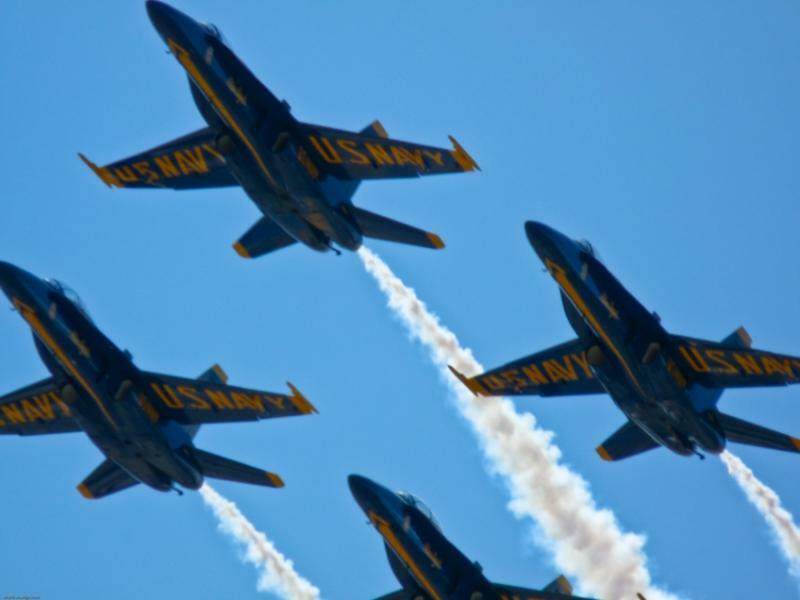 How did you get to be a Blue Angels pilot and what is take to be one? That's a great question. All Navy pilots have a set career track and so we will serve on board an aircraft carrier for a number of years in a role where your forward deployed, taking the fight to the enemy. 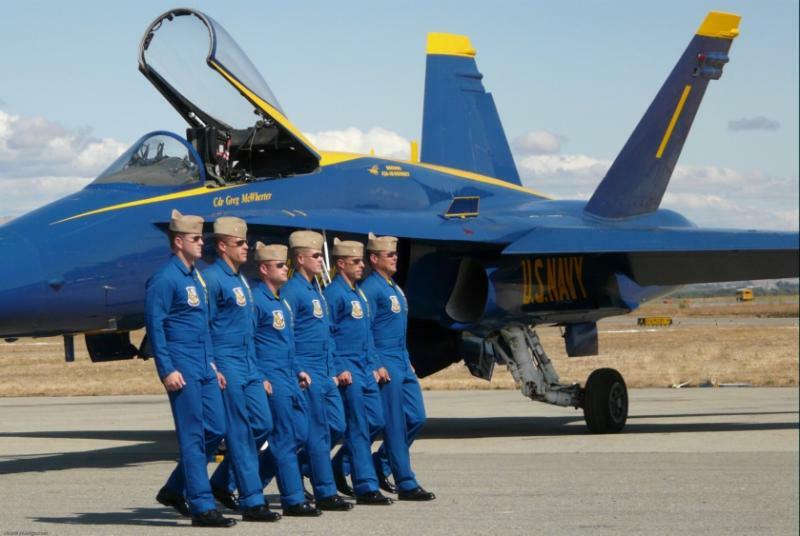 Then after that's over you’re allowed a couple years for what we call a “shore tour” and in that job you're normally a flight instructor, or a test pilot, and it's that time in a career, at least for me where I chose to come to the Blue Angels. 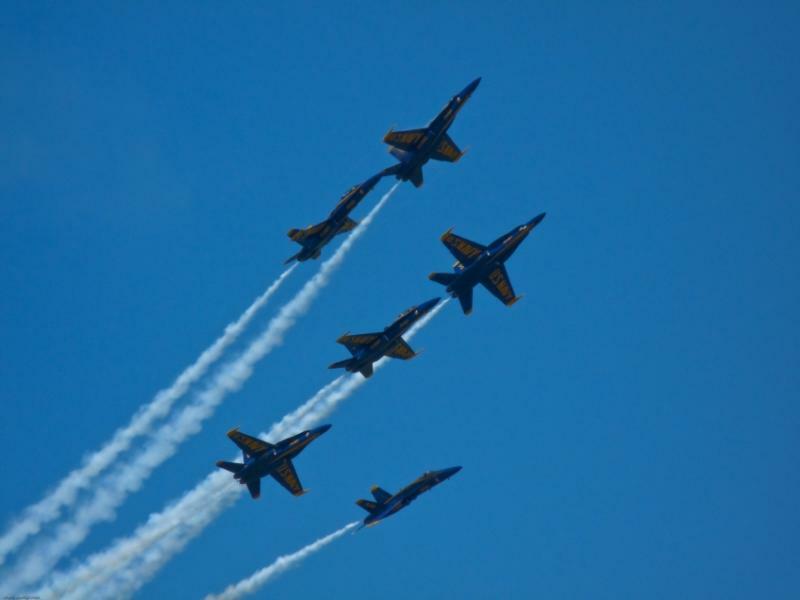 The Blue Angels require a requisite amount of experience because we’re flying low in close formation and there’s some skill involved. You wouldn't want to have a brand-new pilot doing it. So we require that everyone has 1250 hours in jet aircraft and that's important to us and that we have dynamic experience of flying afterburner aircraft is also important us. I applied in 2007 and was lucky enough to be chosen and I’ve been flying with the Blues for the last two years. The elite of the Navy! 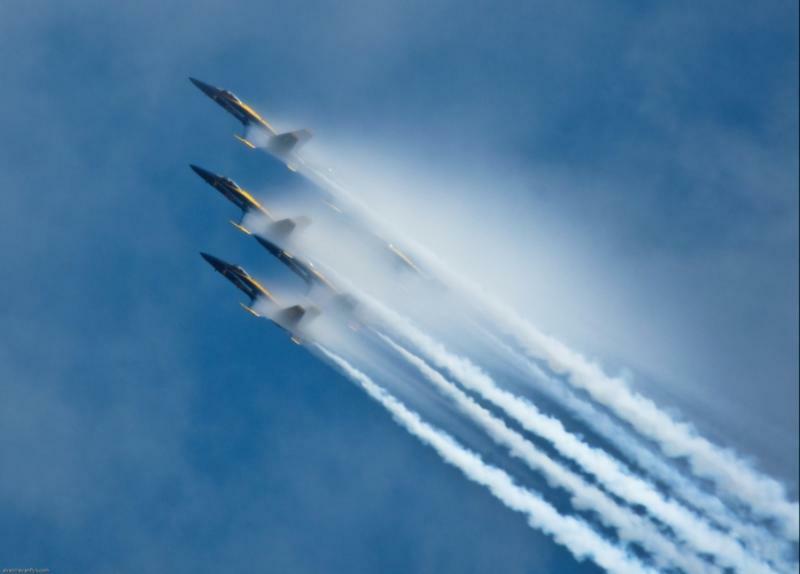 Do you like flying with the Blue Angels? I do. The best part is not the flying as funny as that might sound. The best part is getting to go all over America. We're in 35 different cities just this season and we get to talk to folks all over the country who have a passion for aviation and have a dream to serve their country and that's what we live to do, to show America what they're men and women of the armed services are doing overseas. 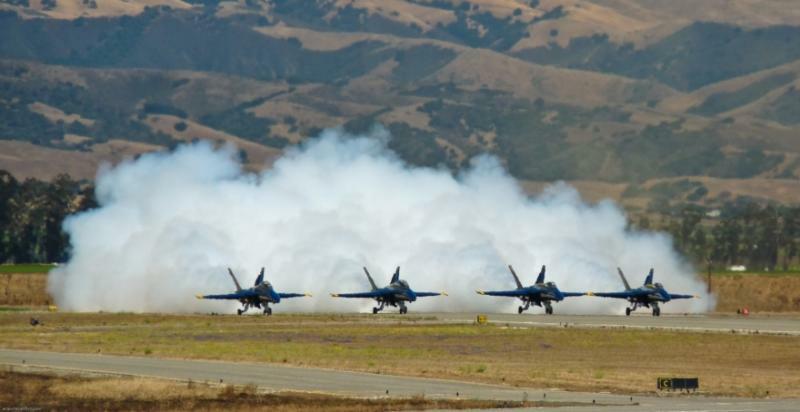 We're going to put on an air show here at Salinas is going to be blue skies like we've got right now, there’s going to be great weather, there’s going to be over 50,000 people out here cheering for us. At the same time this is going on, it’s going to be 2 AM over Baghdad or Afghanistan and my buddies are over there flying the same aircraft, but it's nighttime and they’re bad guys below them and no one’s clapping for them. So we try to show a little bit of pride and professionalism of the military to the folks here at Salinas. It’s very amazing what you do. 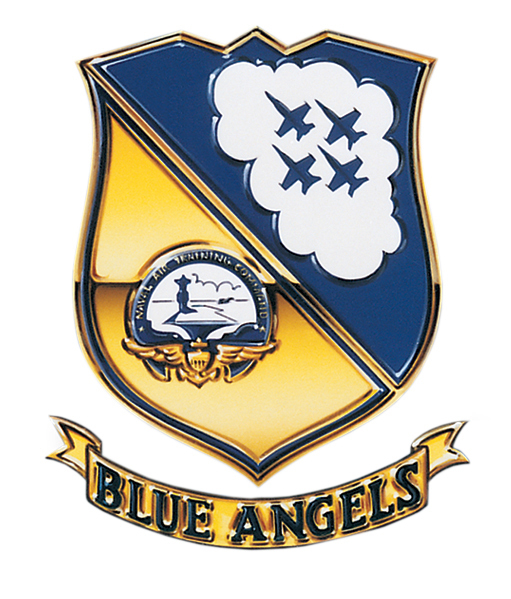 I read the book “First Blue” about Butch Voris and the beginnings of the Blue Angels. How does it feel to be continuing on in that tradition? That's an awesome question Evan! It's an honor to be a part of this squadron and the squadron has done great things and is pleased to carry a great reputation and it's not because of any of the individuals on this team, but it's because of the team and everyone on this team has worked really hard to further that great reputation that Butch Morris started back in 1946. 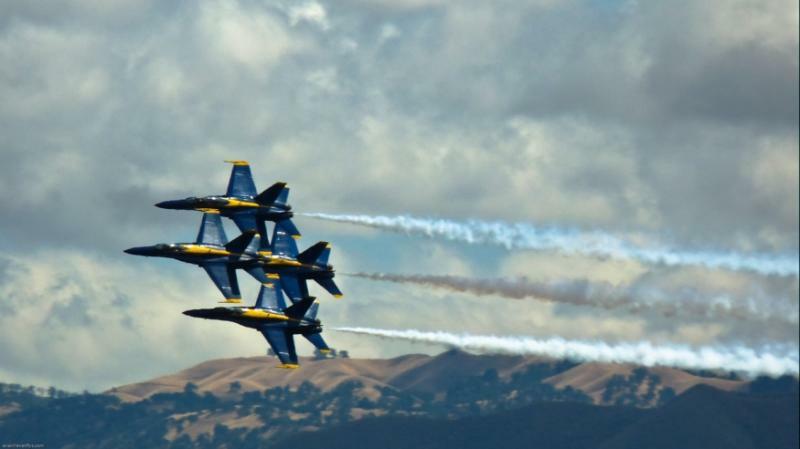 Yep, the Blue Angels are a great team. We certainly strive to be. 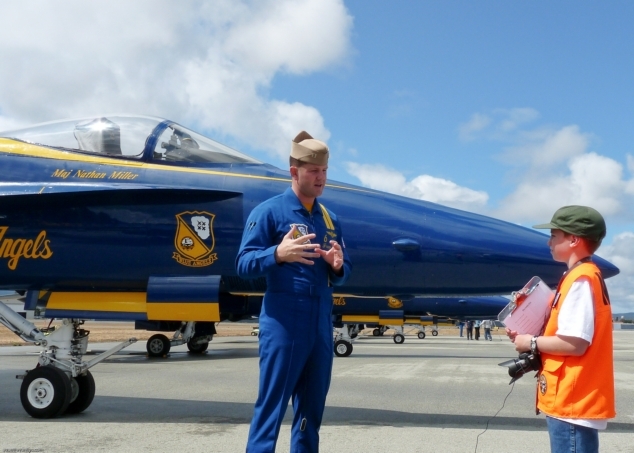 The Blue Angels fly the F-18A model right? Why don't they fly the Super Hornet, and do you know what's different about flying them? Sure. 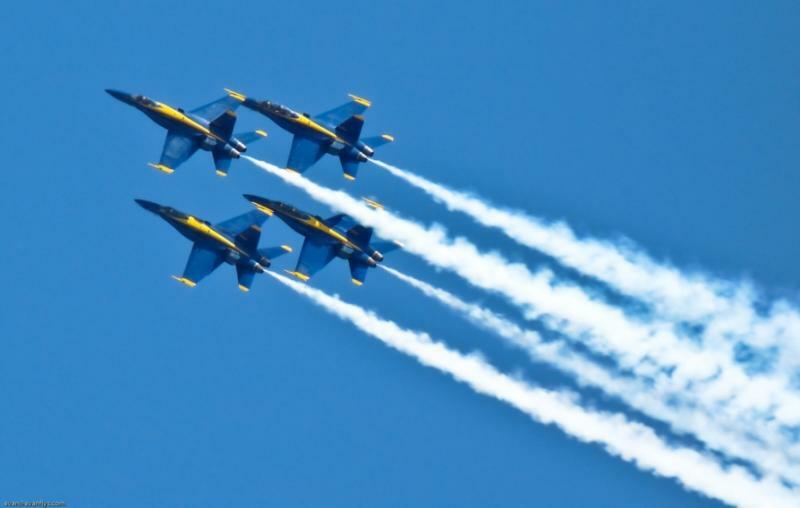 In my personal opinion if I could pick any aircraft in the Navy to fly, in the air show for the Blue Angels it would be this airplane. There's a specific reason that we don't fly the Super Hornet. It costs more and it is more advanced in a combat systems role, and we don't need that to do an air show. There is no way that I could demonstrate the impressive combat systems of our aircraft to show a crowd what these aircraft are capable of in a combat scenario. And so those airplanes are best served to our taxpayers to be overseas and helping the men and women on the ground who actually need those systems. What we need is a lightweight aircraft with strong engines that can go fast, fly low, and pull high G’s, and that's what these “A” models do. This is the lightest Hornet there is. It has the most thrust to weight of any aircraft of any of the fighters and because of that it is perfect for this role. 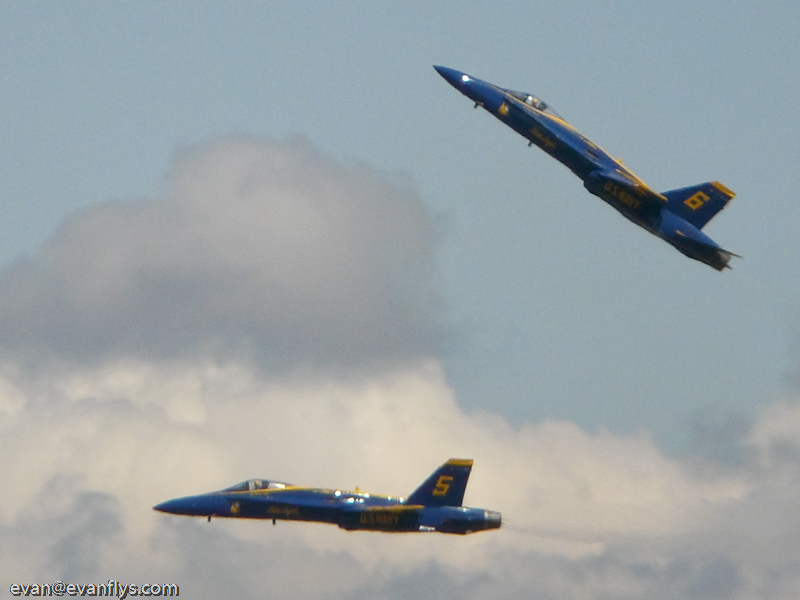 Can you share some cool airshow flying stories with me like anything exciting that happened? Sure. You know anytime were flying over crowd, it's exciting for us and we've had some awesome chances to fly all over the country. We just left Seattle Washington and we were flying in a city of millions of people over a lake and that's challenging for us because here in Salinas we have a show line. We have a 5000 foot line out there of white paint and sand and gravel and we know exactly where we're going. At a lake, we have to use boats to line up and it's more challenging, the terrain becomes more challenging. In Seattle for example, or Chicago where we were last year, we have really tall buildings, and that's a factor for us. We’re having to weave our way through buildings in some cases to put on a successful and safe airshow. I'm thinking of joining the military and flying. Can you give me some advice? Absolutely. Obviously you're going to have to study hard and do well in school. That's understood I'm sure. Math and science are what you'd want to focus on, that's not to take away from English and history and social studies because those are all equally important, but I find that I use math constantly as I'm flying. All the time and you need to be able do it quick and not have to think about it, and having to let your brain slow down the process. And then the more involved that you can be in extracurricular activities, whether that sports or community organizations or your church, or anything like that where you have leadership opportunities, are going to help you significantly as you go into the military. Peer leadership is one of the most challenging things we do and being a fair and good leader to the people below you is equally challenging. Well thanks so much for the great interview! We appreciate you coming out and spending some time with us. Frank and the rest of the Blues were just amazing. 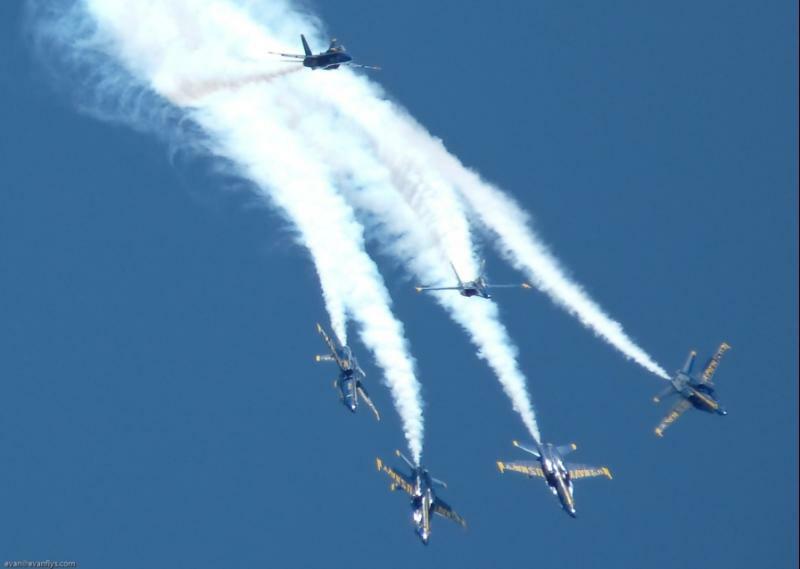 That F-18A is so cool and the Blues are a bunch of great guys! I can't wait to see them fly again!